Bollywood stars have known to be superstitious before or after their release and that’s the reason celebs are often seen going to Ajmer Sharif either before or after their film release. While Kangana Ranaut, Priyanka Chopra, Katrina Kaif, Preity Zinta etc are the regular devotees at Ajmer Shareef, recently we saw Kareena Kapoor Khan too at the Dargah who came to thank for the success of Singham Returns. Kareena’s last two movies Satyagraha and Gori Tere Pyaar Mein flopped at the Box Office and she wanted Singham Returns to do good. Therefore, Kareena was spotted at Ajmer Shareef a few days back. The actress was seen without any makeup wearing a simple blue coloured salwar kameez. Serial Kisser of Bollywood, Emraan Hashmi too was spotted at the Ajmer Dargah, who came to pray for the success of his released film Raja Natwarlal. The actor has given two flops continuously at the Box Office and he is hoping Raja Natwarlal to be a success. Let’s see if actor’s prayers are accepted or not. 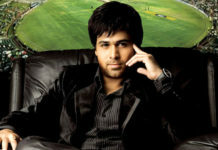 Emraan Hashmi has done quite a lot of promotions for Raja Natwarlal from selling ‘Kick’ movie tickets in black in front of Gaitey Theater to appearing in reality shows, to giving interviews and also appearing in the popular Comedy Nights with Kapil. Hashmi even shelved shooting of his other movies jus to promote Raja Natwarlal which had made his mentor and uncle Mahesh Bhatt upset. But now, everything is fine between them. Raja Natwarlal is about a con man(played by Emraan) who cons people in different manners taking advice from his Godfather(played by Paresh Rawal). Kay Kay Menon is also in the movie playing the role of Emraan’s enemy. Pakistani beauty Humaima Malick will be making her debut into Bollywood with Raja Natwarlal. The movie has released today and is receiving good reviews.